We’ve just brought another premium feature, the A/B Test Tracker, to the Piwik PRO stack! This brand new Optimizely Integration is available for all Piwik PRO users. Read on to see how you can benefit from it. We’re sure you already know what A/B testing is. But just in case, let’s review: A/B testing is a way of comparing two different design or content choices for your website to see which of them gets the best results. For example, you can investigate how your conversion rates change depending on the color of a CTA button. What do you get with Optimizely Integration? To run A/B tests, you can use a dedicated tool like Optimizely. By default Optimizely delivers such data as number of visitors, unique conversions, conversion rate, unique visitors, and also reports on revenue. But for getting to the real heart of your A/B test results, you need far deeper insights powered by dedicated analytics software. You need data about device types, goal conversions, abandonments, and all sorts of other behaviors that can change depending on circumstances. Ecommerce metrics combined with A/B test results can also go a long way towards boosting sales. For example, you can run a test on how a “free shipping” promotion pop up affects your bottom line. One variant can display the offer at the main page and after the first item is placed in the cart, while the other will not display the offer at all. Once the test is finished, just review in-depth analytics reports from a dedicated web analytics tool to see how user behavior changes depending on the version of the promotion used. Apply segmentation, compare user groups, and look at conversion funnel graphics to get the whole picture. And you can view reports broken down by custom dimensions as well. This is what makes integration of A/B testing tools with the Piwik PRO Analytics Suite so valuable. It provides multidimensional insights and data visualizations you wouldn’t get otherwise. 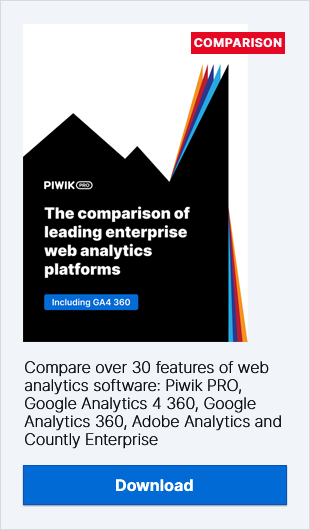 Piwik PRO A/B Test Tracker gives you all your Optimizely data together with Piwik PRO analytics data in one place. This allows you to use segmentation, funnel analytics, and a host of other extended data to give you a full picture of the impact that different versions of your site have on diverse sets of user groups. We’ve made integrating Piwik PRO A/B Test Tracker with your Optimizely instance as painless as we could. In development we’re working on automatic activation and tracking code changes. Either the plugin itself will do the work, or it will be activated through Piwik PRO Tag Manager. Also, it’s important to know that when the feature (plugin) is activated, Piwik PRO automatically uncovers tests already running. In doing so, it automatically generates two new custom dimensions, but without overwriting any existing analytics data. If you want to learn more about Piwik PRO A/B Test Tracker, we’re happy to give you more information. Click here to reach out to us.